Growing up, I never liked the idea of Good Friday. Perhaps it was due to the name, which didn't seem accurate. What could be good about nail pierced hands, a crown of thorns, and a cross? Was it even permissible to be happy on a day that commemorates a crucifixion? I think about this day differently now. Within the last 24 hours, Brooke colored on the kitchen table with a pen, leaving behind permanent scribble. Reese's carelessness resulted in a Google search on how to remove gum from a microfiber couch and berber carpeting. They've nagged. They've bickered. They've gotten under my skin. Yet, even during their most annoying moments -- moments when behaviors and attitudes are unacceptable, moments when they're deliberately disobeying, I wouldn't need to think twice if they were put in harm's way. I'd step in willfully. I'd risk my own well-being to save them from harm. As a parent, you know this. Deep in your heart, you've looked at your children and felt the brunt of this sobering realization: you'd die for them. That's the heart of God. God knew we were in harm's way. Our sin had separated us from him, and he willingly risked his own well-being for our good. Knowing that the cross would serve as the bridge to connect us again with God, he chose death. This is good news. It's not pretty. It's not budding tulips, fluffy chicks, and pastel eggs as we're apt to distill Easter, but it's good in every sense of the word. A holy good. Yes, the day is named accurately. Originally posted April 22, 2011. Resurrected for today. This is beautiful Robin. Yes, it is a Good Friday and this is Good News... that we are saved because we are loved. Not by our merits or will but because of our Lord's amazing grace. I love this perspective. 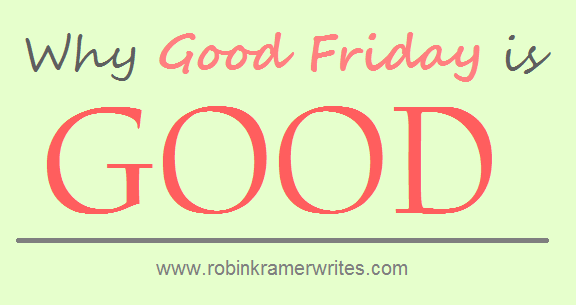 My children have often asked "Why to the call it GOOD Friday when it's the day He died?" I have struggled to answer, but this is perfect. Good Friday Blessing to you and your family! 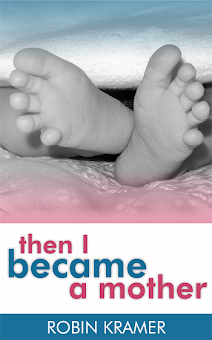 I never knew how much God loved me...so unconditionally...so greatly....so deeply....so intensely...until I delivered my first child. And it took my breath away! The beauty of the cross and God's desperate measure to be friends with me! ME!!!! !